My dad, a toolmaker for Ford Motor Company, used to say he could make anything out of metal. He also said, “The difficult I can do tomorrow; the simple takes a little longer.” It’s the same with photography—or any kind of art or design endeavor. Nature is in the complexity business. Attempts toward simplicity however, whether in creative expression or lifestyle, requires concerted effort. In my Visual Communication classes we discussed the continuum of complex imagery at one end of the spectrum and simplicity on the other. It’s not just the number of visual elements within a frame that makes an image complex. It’s also the fact that the expanded relationship—element to element—provides a high level of potential for viewers to “read out” and “read into” the image. The upside of complex imagery is that it carries a great deal of information. That’s the downside as well. With so much potential to read or interpret, there’s a tendency to treat complex images superficially, to give them a glance—long enough for recognition and response—and move on. This is how we consume magazines, movies and the electronic media. It doesn’t have to be that way, but as a culture we Americans tend to be information hungry and rapid consumers of it—like we have to get it all in as quickly as possible. Since childhood, we’ve been taught that more information is better. No doubt. But under certain circumstances, there’s more power to be realized in simplicity—because it triggers emotion. As noted, simple images require more attention and effort. Make a frame with your fingers and look around your room. Try to find any subject matter that has just a few elements within that frame. Out in the world it becomes even more difficult. Exceptions include certain monasteries where simplicity of lifestyle and environmental design is a lived discipline. The message and practice in these places is consume less and appreciate more. Simplicity is largely absent from our everyday environments—and lives—because it requires the reduction or elimination of elements. Consuming more—media especially—leaves little time for appreciating what we have. Neither approach is right or wrong, good or bad. Each derives from different perceptions of the world, life and the cosmos. In contrast to the simple image above, here’s a complex image. So a simple design requires a process of elimination. As the number of elements are reduced, the impact of the image increases. 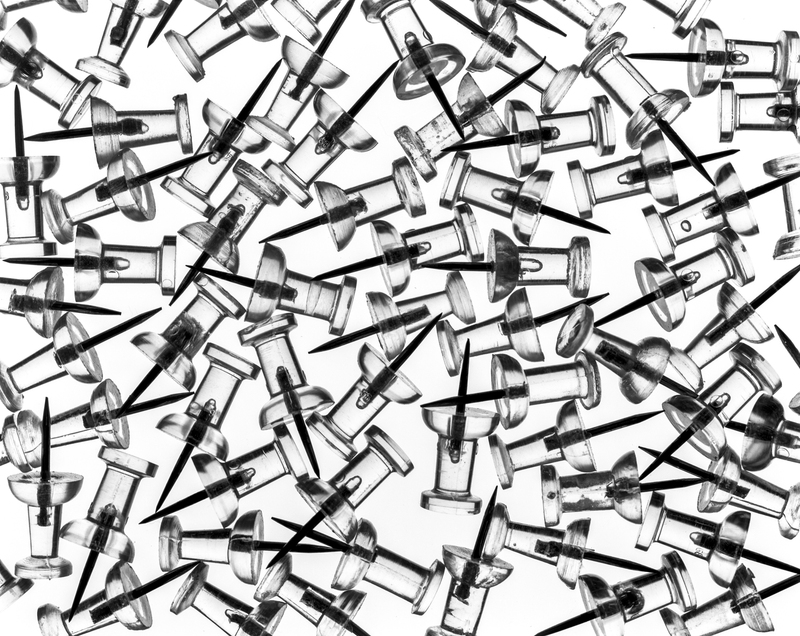 In the image of the single push pin there are only three elements—the black background, the plastic holder and the metal pin. The complex image contains the identical subject matter, but the number of elements is significantly higher—and the brain tries to make sense of it by considering the relationships. After a quick glance we move on so as not to be overloaded. With a simple image we engage longer because it’s unusual and appealing. There a harmony, a quality of satisfaction and interest that come from tapping into the essence of a subject, perhaps its perfection. When the communication objective is to convey information, complex imagery or design is the advisable approach. When it’s to convey an experience or emotion, simplicity is a better strategy. Sometimes. Like verbal communication, visual communication can be messy. There are always exceptions. Applying these observations to my life, I notice how difficult it is to simplify. It’s not just that I have so much stuff—I need it to do my work and pursue my interests. I think of the Native Americans who, living in teepees, could gather their belongings in a morning and move on. I also think of the people who educate themselves and work hard for many years to achieve high level positions and salaries, only to find their jobs stressful and unfulfilling. In his groundbreaking and visionary book, Voluntary Simplicity, Duane Elgin made the case for living with balance and ecological awareness—a life that is “outwardly simple and inwardly rich.” More recently, Linda Breen Pierce’s book, Choosing Simplicity: Real People Finding Peace and Fulfillment in a Complex World provides compelling stories of people who chose to simplify their lives. Seeing the above images together, I notice that they depict different states of consciousness as well as communication and lifestyle strategies. Waking consciousness is extremely complex and dynamic. It needs to be in order for us to engage in and process information. Recently, brain researchers found that sleep performs a cleansing function for the neurons, equivalent to erasing the buildup of chalk on a blackboard. The mind becomes renewed. The act of contemplation does the same thing in a waking state by focusing for a time on just one thing. And perhaps the ultimate elimination of mental complexity comes with meditation. The reason, I suppose, is that meditation’s proper object is being rather than doing or having. Just being. Simplicity is one of the qualities I look for and try to create when photographing. In the world outside the studio this is extremely challenging. It’s hard to eliminate, to crop out elements that don’t contribute to the point of critical focus. Even with a closeup lens, for instance when shooting flowers, there are leaves or weeds or fences in the background. This is why I often bring subject matter into the studio and shoot it against a black or white background. 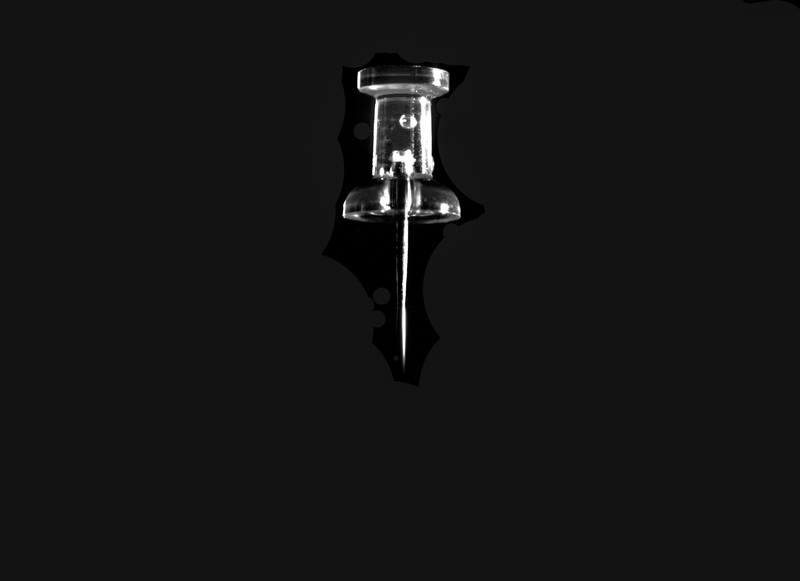 I’d photographed a push pin in my early years of college. It was a nice image, except the camera’s lens was not very sharp. Reviewing it years later I thought the subject had possibilities, so I shot it again and composed it differently. Here, the camera looked down on the pin, which lay on a piece of glass suspended over a velvet cloth. The pins on the white background were shot on a light table. This entry was posted in Uncategorized and tagged brain researchers, Choosing Simplicity, communication strategies, complex, complexity, Contemplation, design, Duane Elgin, feeling, Ford Motor Company, fulfillment, impossible, information, Linda Breen Pierce, meditation, metal, Native Americans, push pin, simple design, simplicity, Visual Communication, Voluntary Simplicity. Bookmark the permalink. This is such an important reflection which I know will stay with me. I strive for simplicity in my work – trying to translate complex theories into the simplest practices in parenting. But I think the complexities I encounter everywhere compete with my ability to pair down to essences. I notice I am much better able when I meditate and am disciplined about removing complexities to bring my full focus. I love the quote from Steve Jobs! Thank you and will continue to reflect on this!